Even though we're still in the thick of Summer, a few turning leaves bring on thoughts of Autumn. Before we know it, the days will be shorter and the air crisper, and even though Summer is welcome here for as long as it will stay, I do love the changes that Autumn brings about. 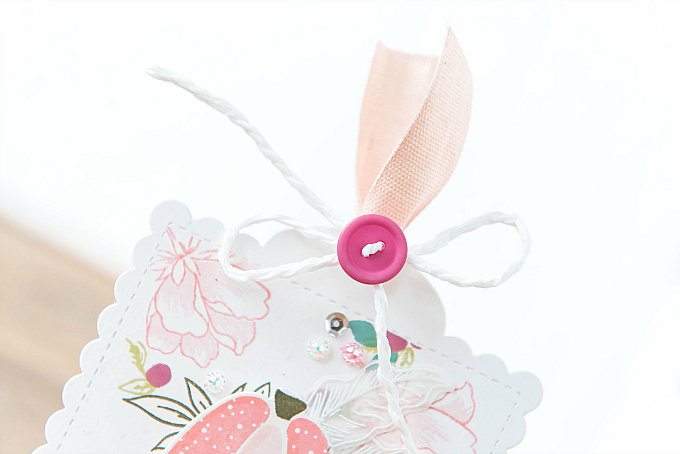 Today's tag is a super simple little piece! 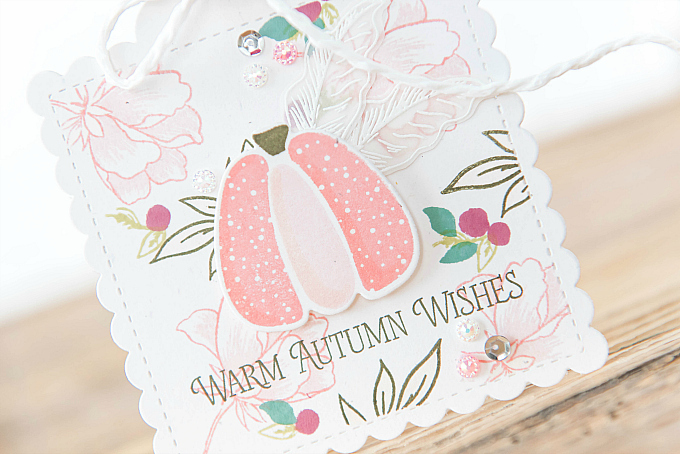 It was inspired by Melissa's sweet pastel pumpkin card over on the PTI blog. Her pink pumpkin especially caught my eye! You can check it out here. I started this tag with PTI's Tag Sale Quilted die, and used my newest favorite Altenew Peony Bouquet stamp set to create a colorful background. 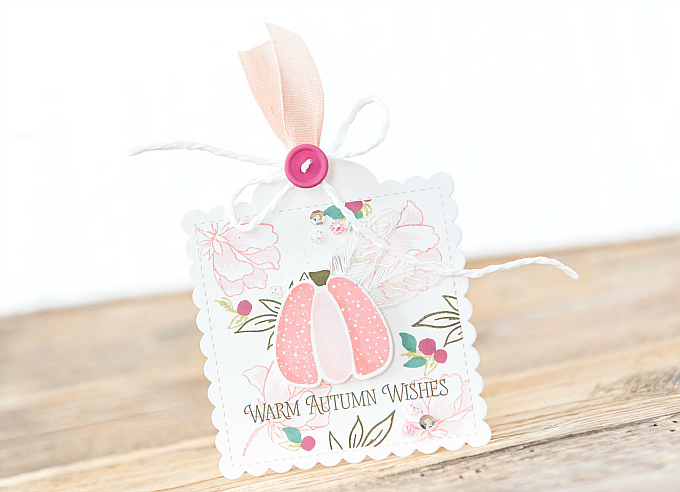 This beautiful stamp set is currently a part of a huge sale on SB.com - most Altenew stamps and dies are 20% off or more, meaning this gorgeous (and really large) stamp set is under $18! You can use my link above or use the link provided in the supplies list below. The sale is valid until midnight Thursday, September 20th! Happy Shopping! 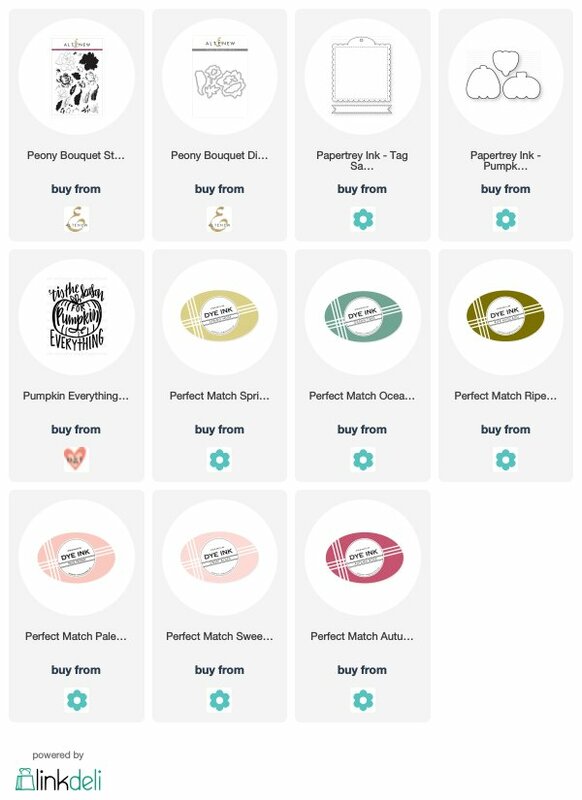 I stamped the flowers, leaves and berries in colors of Ripe Avocado, Ocean Tides, Pale Peony, Sweet Blush, Autumn Rose, and Spring Moss. I added some toppings, and also a few little sparkly bits here and there. I used PTI's Pumpkin Patch stamps for the sweet little centerpiece. They are no longer available but they do still have some dies in the shoppe. 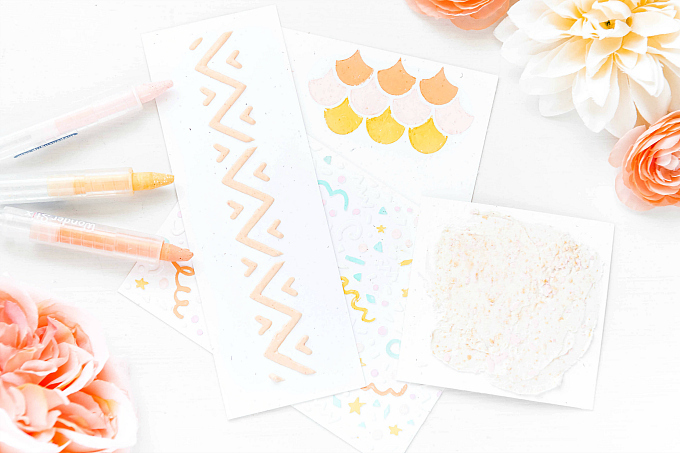 Pairing up the dies with some marker magic could work just as well as having the stamps, or perhaps this little stamp could do as a more trendy alternative? To finish up the tag, I stamped and embossed a few of the pretty leaves from the Altenew set onto vellum before die-cutting them. This is delicate and so sweet! I just love the colors and that darling pumpkin! Isn't that pumpkin the sweetest?! Thanks so much for all of your love, Lisa! Sending you a heap of hugs! What a delightful tag! I love the way your combined the stamps. So very pretty. This is so sweet! I loved Melissa's pastel pumpkins, too. Thank you so much, Mary Rose! I seem to always feel inspired by Melissa's creations. Her work is stunning! Beautifully crafted tag, Ivanna! Your stamping & choice of colors & images always inspires me! Aww Greta, that makes me so happy! I hope you know how much you inspire me too! Big hugs to you, dear crafty friend!